bgo Vegas is connected to a cross platform gambling portal which offers several products such as bgo Bingo, bgo Macau (live dealer casino), bgo mobile, and bgo Casino. bgo Vegas specialises mainly in online slot machines and bgo Casino has a wide range of other online casino games. bgo is powered by multiple software providers, including NYX Gaming, Net Entertainment, IGT Interactive, bwin.party, Sheriff Gaming, NextGen, Microgaming and proprietary software. When you sign up here, the welcome bonus entitles you to as much as 20% cashback every time you play, plus there's also a 200% Slots bonus worth £200 (which is available on your first ever deposit). Players can contact the customer support here between 08:30 to 17:30 Monday to Friday via Chat (live chat). You can also write to them or fill out an online email entry form and you will receive an instant automated response letting you know that they have received your query. This website is currently only available in the English language. Bgo Vegas and bgo Casino are both licensed in the Isle of Man and both products are owned by BGO Entertainment Ltd. bgo Vegas offers a range of different online slots which fall into the following categories: 10 lines or less, 11-20 lines, 21-30 lines, 31-50 lines, 51+ lines and Progressive Slots. 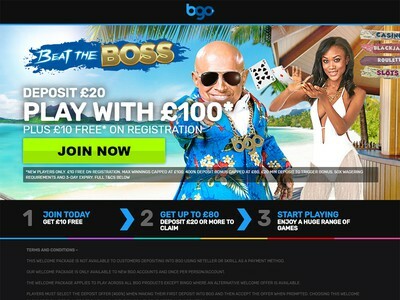 Bgo Casino offers slots as well as a wide range of other exciting online casino games, plus you can also take party in weekly online casino tournaments for real cash prizes. Some of the most popular titles (at bgo Vegas) include The 100,000 Pyramid, Robin Hood Shifting Riches, 100 Pandas, Monopoly Here and Now, Pixies of the Forest, Irish Eyes, Monopoly Plus, Mad Mad Monkey, Kitty Glitter, Jack and the Beanstalk, Da Vinci Diamonds, Gonzo's Quest, Star Burst and Space Wars. Other popular games (at bgo Casino) include Hot Streak Blackjack, Roulette with Hot Streak Bonus, Single Deck Blackjack, Deuces Wild 100 Hand, Pontoon, All American, Punto Banco and 3 Wheel Roulette. There are some fantastic promotional offers available almost every day here which registered members can take advantage of and some of the online casino banking methods accepted here include Visa, MasterCard, PayPal, Maestro and Ukash. bgo Vegas is one of the most impressive online casinos available for gambles today and it is certainly one that we highly recommend.